SHORE THIS AGAINST YOUR RUIN: The art of creating deliberate fragments dates to the late 18th century, when poets, composers, sculptors, and even architects began to explore the evocative qualities of partial objects. By 1813, this tendency had become so pronounced as to be seen as a fad; thus Francis Jeffrey, editor of the Edinburgh Review, was moved to remark that “The Taste for Fragments, we suspect, has become very general, and the greater part of polite readers would no more think of sitting down to a whole epic than to a whole Ox.” In retrospect, Jeffrey’s cleverness misses the point. Fragments aren’t just easier, bite-sized substitutes for the larger wholes from which they ostensibly come. In contemporary culture, pre-distressed, deliberately broken, and intentionally partial objects stand on their own, sometimes as disruptions and critiques of an ideology that assumes completion and unity, other times as kitsch. In Figure Fragments: The Part as The Whole, the exhibition on view at the Channing Peake Gallery through Friday, January 18, curator Priscilla Bender-Shore has brought the weight of this creative practice of deliberate fragmentation to bear on what is perhaps the most charged of all images of essential unity: the human figure. Sarah Jane Lind graciously provided the funding for this outstanding and substantial show, which features artists from Santa Barbara, Ventura, and Los Angeles counties, many of whom will attend tonight’s opening (Thursday, September 6, from 5-8 p.m.). Photographer Patricia Houghton Clarke strikes a lovely opening note of tenderness with her elegant large-format group portrait “Family Tree.” Three pairs of bare feet appear in close-up — recognizably those of a mom, baby, and dad. Mom’s ankle bears a delicate tattoo of tree roots, supporting the title’s metaphor. Rebecca Erbstoesser’s “Family Crest” series, despite its similar title, comes at its subject from a very different angle, superimposing dramatically foreshortened views of the human ribcage, spine, and pelvic bones with delicate tracings of snowflakes for an overall effect that does, in fact, resemble traditional heraldic iconography. In vivid black and white, these images occupy the territory where fascinating verges on disturbing. Mary Heebner and Keith Puccinelli have contributed a pair of giant heads that work as effective pendants for the installation, each work facing one of the gallery’s two main entrances. 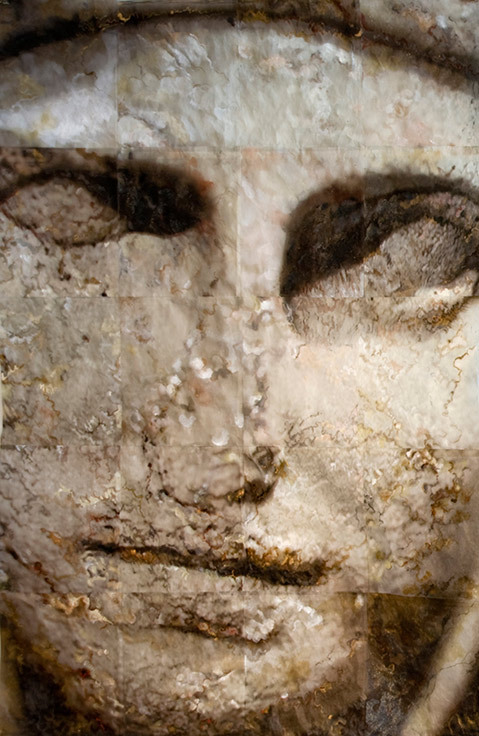 In “Theo: Geography of a Face” (2009), Heebner has represented the head of an ancient Mediterranean sculpture in close-up by assembling a grid out of handmade paper. The complex interplay of texture and focus achieved here through the accretion of collage, ink, and graphite/acrylic layers brings the image alive; each of the panels morphs and breathes as the viewer moves closer, then further away. This brilliant, iconic image captures the artist’s thoroughly developed technique at a dazzling high point. Across the room, Puccinelli has also assembled a composite image out of a grid of individual sheets, but to a different purpose. His “Head-Off” (2005) makes a blistering antiwar statement out of the severed head of Puccinelli’s signature clown. With bulbous red nose and open mouth battered, eyes closed, and suspended trophy-style by four lengths of fishing line, this gruesome self-portrait pushes satire well past the zone of polite discourse.